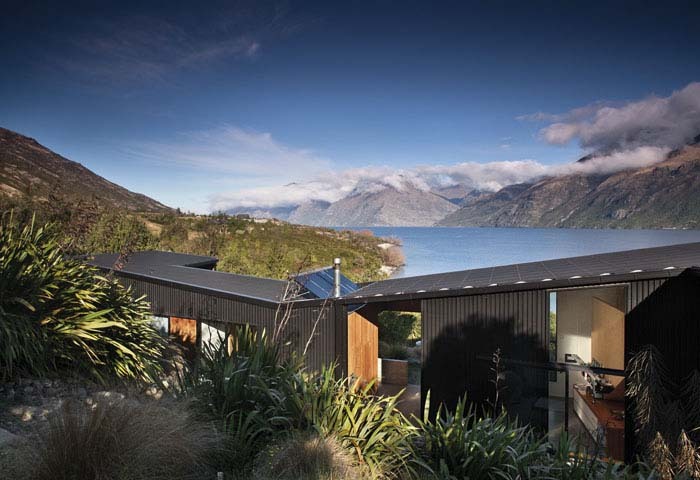 Architectural practice kerr ritchie explain their approach to integrating comfort and seasonal warmth into two South Island houses. 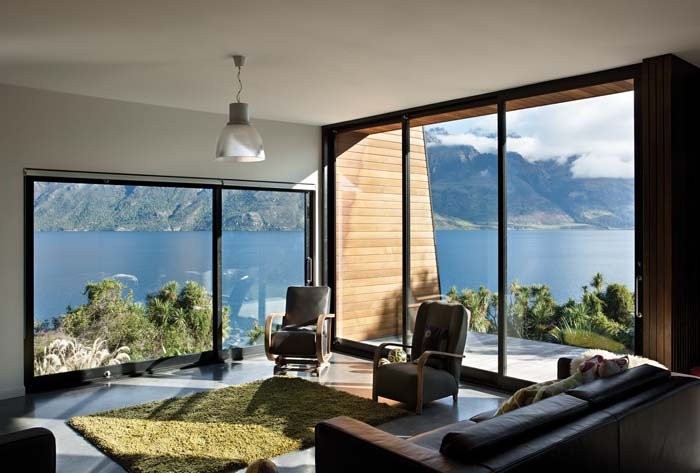 Living and designing in the south of New Zealand brings rewards and challenges. Perhaps the most significant factor is that we have very distinct seasons. Summers can be very hot whilst winters can feel prolonged and drawn out. Seasonal variations are often at the heart of our design thinking. Invariably our initial dialogue with a client is centred around creating seasonal comfort by heating a house. While we design houses of all sizes, our natural preference is to create smaller, more efficiently utilised buildings rather than larger, expansive structures that require loads of energy to heat and with lots of infrequently used rooms. We don’t feel drawn to design spaces that attempt to cope with every eventuality or even the next set of owners. Warmth and comfort should be incorporated into any house design in a practical way. A lot of it is common sense. For example, wherever possible, buildings should be oriented along an east-west axis to maximise their solar gain. On a steep site facing south-west and with an unfriendly contour, more consideration is required to maximise sun and light. Other factors that come into consideration include designing for natural ventilation in the summer months. This entails placing opening windows for cross ventilation, planning active living or working areas on the north-facing side, and keeping less intensively used areas such as storage spaces or bathrooms on the south-facing side. Overhangs or other devices such as trellises or deciduous trees can provide shade in summer. We also ensure that passively solar heated buildings with high solar exposure have adequate materials with good thermal mass properties. This maximises their energy efficiency and creates comfort in both warm and colder seasons. Providing high insulation and reducing air infiltration in walls, roofs and floors is vital to any design for a cold climate. Within our practice, we generally allow for more insulation than the New Zealand building code specifies, since this is the bare minimum for a cooler climate. 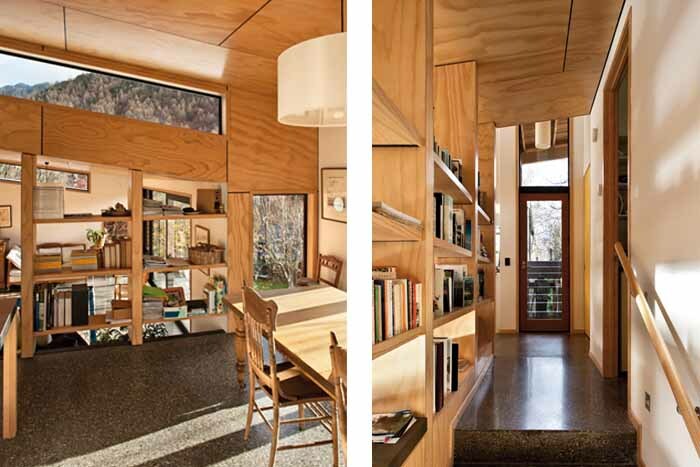 Both the Drift Bay and Arrowtown houses have been designed using passive solar principles. Both buildings have north facing floor-to-ceiling windows. 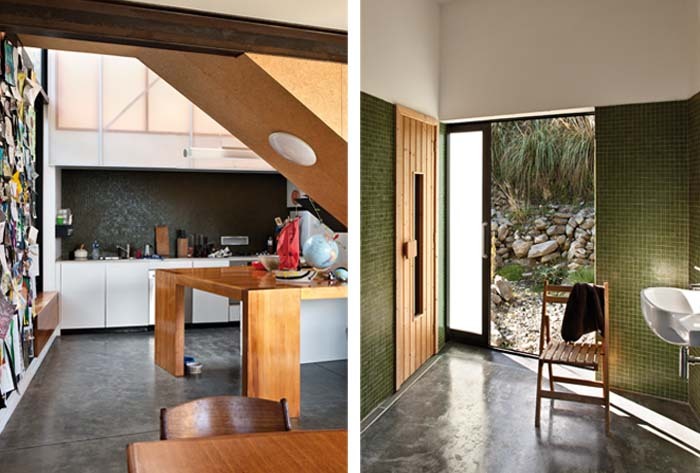 This allows the sun to heat the mass of the polished concrete floors, double glazed windows and extra thick timber framed walls for additional insulation. Whilst central heating systems provide for a very comfortable house, they come at a cost for both installation and ongoing running. We’ve discovered that the ‘belt and braces’ solution for heating a large house in a cold climate involves a combination of underfloor heating and radiators. Radiators provide for a rapid heating response, while the underfloor system provides the background heat. For example in the autumn and spring shoulder seasons, the weather can abruptly turn cold. Turning on the underfloor central heating is not always the best option as this is a slow response. It takes time and plenty of energy to bring the floor mass up to temperature. Once the slab has been heated, invariably the sun comes out which is disappointing after all that effort. Having radiators or a similar heat source to rapidly heat the air temperature is a useful solution. In our Drift Bay House, water for both domestic use and underfloor heating is heated by a solar hot water system combined with a wood pellet boiler. The sun heats all of our water for about five summer months. Consequently our electricity accounts are modest. An added bonus of installing a boiler for the winter months is that the small room where it lives acts as a fantastic drying room. The boiler in the Drift Bay house is located directly opposite the laundry. Although ground source and air-to-water heat pumps are now available, I can see many families being reluctant to forego the advantages of a boiler room. For when the weather turns cold or the shoulder seasons dip in temperature, we have installed a small woodburner into a cosy room to create a warm, comfortable retreat. We don’t have radiators and find we get by quite comfortably without them. 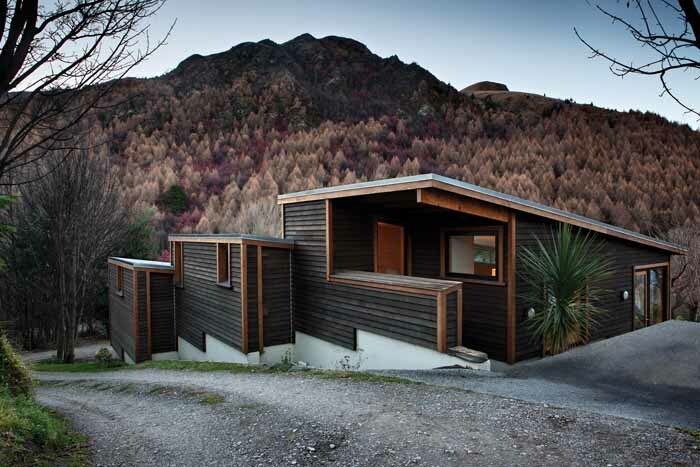 The Arrowtown house in contrast uses heat pump technology. This captures the earth’s natural heat by a series of vertical bores and uses a heat pump to condense this to heat the floor throughout the building. This is the only heat source in this house. We’ve made provision for a log fire to be added later so that during the evenings, the living room temperature can be raised for additional comfort. Recently we’ve also been recommending that some clients install a pellet fire with built-in timer in their living rooms so that it can switch itself on as required. This is great for the shoulder seasons when the central heating is off and the cold weather sets in, or in a small house as an alternative to a central heating system. To be sure, this diminishes the romance of a roaring log fire, but the convenience provided by the automation plus the lack of need for firewood gathering and storage weighs heavily in favour of the pellet fire.